Julia Lezhneva is one of the leading artists of her generation. The young Russian soprano with the voice of ”angelic beauty” (The New York Times), “pure tone” (Opernwelt) & “flawless technique” (Guardian) brings “unforgettable spiritual expression” & “perfect artistry” (Guardian) performing worldwide. Her international career skyrocketed when she created a sensation at the Classical Brit Awards at London’s Royal Albert Hall in 2010, singing Rossini’s Fra il padre at the invitation of Dame Kiri Te Kanawa. 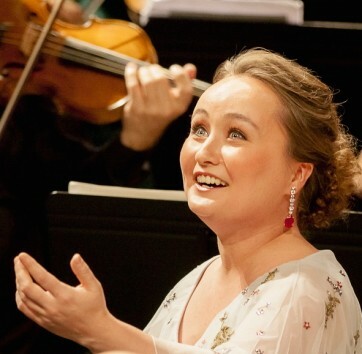 Since then, Lezhneva has been appearing in concert and opera around the globe – the Royal Opera House Covent Garden, Royal Albert Hall & Barbican in London, Severance Hall in Cleveland & Lincoln Center in New York, NHK & Bunka Kaikan in Tokyo, Amsterdam Concertgebouw & Madrid Auditorium, Salle Pleyel & Theatre des Champs-Élysées in Paris, Wiener Konzerthaus and Theater an der Wien, Berlin Staatsoper & Hamburg Laeiszhalle, Essen Philharmonie and Zurich Tonhalle, Theatre Royal de la Monnaie and Palais de Beaux Arts in Brussels, The Bolshoi Theatre & Melbourne Recital Centre, Grand Hall of Moscow Conservatory and Grand Hall of St-Petersburg Philharmonic – as well as for the Salzburg Festival, Salzburg Mozartwoche, Baden-Baden Festspielhaus, Gstaad Menuhin Festival, Chorégies d’Orange, Verbier Festival, Handel-Festspiele Halle, Quincena Musical, Wratislawia Cantans, Misteria Paschalia, Rossini Opera Festival & S. Richter ‘December Nights’ Festival in Moscow. She appeared on stage with conductors – Marc Minkowski, Giovanni Antonini, Sir Antonio Pappano, Herbert Blomstedt, Alberto Zedda, Philippe Herreweghe, Franz Welser-Möst, Sir Roger Norrington, René Jacobs, Fabio Biondi, Jean-Christoph Spinosi, Diego Fasolis, Ottavio Dantone – and singers – Plácido Domingo, Anna Netrebko, Dame Kiri Te Kanawa, Joyce DiDonato, Juan Diego Flórez, Rolando Villazón, Ildebrando D’Arcangelo, Christopher Maltman, Franco Fagioli, Max Emmanuel Cencic, Philippe Jaroussky. Born December 5 1989 in a family of geophysicists on Sakhalin Island, she began playing piano and singing at the age of five. She graduated from the Gretchaninov Music School and continued her vocal and piano studies at the Moscow Conservatory Academic Music College.. At 17 she came to int attention winning the 6th Elena Obraztsova Opera Singers Competition 2007, and next year shared the concert stage with Juan Diego Flórez at the opening of the Rossini Opera Festival in Pesaro. In 2008 she began studying with tenor Dennis O’Neill in Cardiff, completing her training under Yvonne Kenny at London’s Guildhall School. She has attended masterclasses with Elena Obraztsova, Alberto Zedda, Richard Bonynge and Thomas Quasthoff. In 2009 she won first prize at the Mirjam Helin International Singing Competition in Helsinki and the following year took first prize at the Paris International Opera Competition, the youngest entrant in each competition’s history. Her European performances started at the age of 18 with the invitations by Marc Minkowski, with whom she has performed and recorded Bach’s Mass in B-Minor in 2008 and subsequently performed numerous solo concerts, operas and oratorial works. In 2010, being 20 yearls old, she made her triumphal debuts at the Barbican performing Vivaldi’s Ottone in Villa with IGA/Antonini and at the Salzburg Festival performing solo concerts under Marc Minkowski. Opernwelt named her “Young Singer of the Year” in 2011 for her debut at La Monnaie in Brussels. The following year she performed at the Victoires de la Musique Classique in Paris and appeared at the Salzburg Festival in Handel’s Tamerlano opposite Plácido Domingo. Her 2012/13 season included European tours with Giovanni Antonini and Il Giardino Armonico, Pergolesi Stabat Mater recording and performance with Philippe Jaroussky, concert tours of Handel’s Il trionfo del tempo & Handel’s Alessandro and Gala at the Chorégies d’Orange televised on France 3. During 2014/15 Lezhneva made her Australian debut winning the HELPMANN Award for her recital at the Hobart Baroque Festival. She toured extensively with Handel programme throughout Europe including concerts at the Barbican, Paris, Brussels, Aix-en-Provence, Zurich, Munich and the Bolshoi in Moscow. She made her Royal Opera House debut in June 2015, singing Zerlina in Mozart’s Don Giovanni and reprised the role on the ROH Japan tour in September 2015 under Sir Antonio Pappano. The season 2015/2016 season saw Lezhneva further touring Europe with Siroe, Tamerlano and Handel solo concerts from October to December. In February Lezhneva gave a recital at the Théâtre des Champs-Elysées, Paris and in April at the Lizst Academy in Budapest. In Spring 2016 She performed staged appearances in Così fan tutte (Fiordiligi) in Wiesbaden & Liederabend at the Wiener Konzerthaus with Mikhail Antonenko. April 2017 marks the release of ‘Graun Arias’ on Decca accompanied by Concerto Köln and conducted by Mikhail Antonenko. Lezhneva tours the programme to Paris, Munich, Zurich and Dresden with KOB. In May 2017 she reprises Siroe staged in Wiesbaden during the Maifestpiele and in June – Mozart’s Don Giovanni (Zerlina) at the Gran Teatre Liceu in Barcelona, opposite Mariusz Kwiecen. July sees Julia performing Stabat Mater with Max Cencic in Herrenchiemsee, while in August the artist performs concerts in Reingau and Gdansk as well as recital at Peralada Festival. Summer 2017 ends with an 8-concert tour of Mozart’s Requiem (Soprano Solo) with MusicAeterna and Teodor Currentzis, bringing the artist for the 1st time to Bremen Musikfest and opening season at the Vienna Konzerthaus. Julia Lezhneva became an exclusive Decca artist in 2011. Her first recording under the new label, “Alleluia” – a coupling of baroque motets accompanied by Il Giardino Armonico under Giovanni Antonini, was released in March 2013, leading BBC Music Magazine to say: “She is like a sun that can’t help but produce warmth and joy when she comes on stage.” The recording won her an Echo-Klassik Award. Her collaboration with Max Emanuel Cencic on Handel’s Alessandro led to a Complete Opera CD of the Year prize at the inaugural International Opera Awards in 2013. She joined Cencic again on the world premiere recording of Hasse’s Siroe. Lezhneva’s new solo album ‘HANDEL’ – a selection of sacred and secular pieces from the composer’s overwhelmingly successful early Italian years – has been released in November to critical acclaim. Lezhneva is accompanied again by Il Giardino Armonico under the direction of Giovanni Antonini. April 2017 marks the release of ‘Graun Arias’ – world-premiere album featuring opera arias by Carl Heinrich Graun unearthed by Lezhneva at the Staatsbibliothek zu Berlin. The CD is accompanied by Concerto Köln and conducted by Mikhail Antonenko.